It’s Spring and we are well on our way into Lemonade Stand season! That means it’s a perfect time to highlight the virtues of Lemonade Stands (including stands with a purpose) and get you excited to do one this year. Well Loved – Kids have positive associations with lemonade. Math Exposure – It’s a simple way to introduce them to cost of goods and profit. (I cover this with activities and illustrations in my book) and get them handling money. Hi Tech – While the product itself (a cup of lemonade) is low tech, you can teach kids about technology whether it’s showing them how to promote their lemonade stand on social media or having them code a lemonade stand app. Fun without a Big Commitment – It doesn’t require an ongoing commitment, it can be a fun half day project. Connect to a Cause – Help your child to identify a cause they are interested in and see if they want to donate some of their profit. Here are some great examples of girls (with the help of their parents) using lemonade to help a cause they are passionate about. Me and The Bees Lemonade – 11 year old Mikaila Ulmer sells bottled lemonade and donates a percentage of the proceeds to save honeybees. In addition to selling lemonade at entrepreneurial events, her product is now available at select Whole Foods and other retailers. She also appeared on Shark Tank where she secured $60,000 for 25% of her company, from Daymond John. And this is cool, her flagship flaxseed lemonade recipe came from her Great Granny Helen. Here are some of the local and international organizations she supports that are fighting hard to save the honeybees. 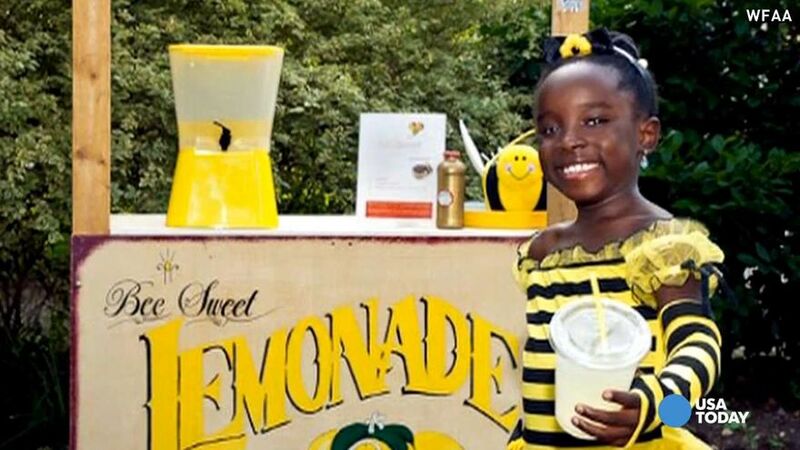 Make a Stand – Vivienne Harr put up a lemonade stand every day for 365 days and with the help of her dad, a social media expert, she raised $100,000 to end childhood slavery. Along the way she met the Dalai Lama, learned about crowdsourcing through fundly.com and more. Alex’s Lemonade Stand Foundation (ALSF) – Your local lemonade stand can be part of a national movement to raise money for research into the treatment and cure for childhood cancer. The organization founder is Alex, a young girl who had pediatric cancer, her parents continue their 7 year old’s work through ALSF. I highly recommend watching the featured video on their homepage. Be sure to come back and tell us all about your stand.